These photos were taken on July 1, at 6:45 PM. The "Take It!" came while taking newspapers to the outside recycling bin after a big rainstorm had passed through and left the afternoon sun shining in full cloudless sky. 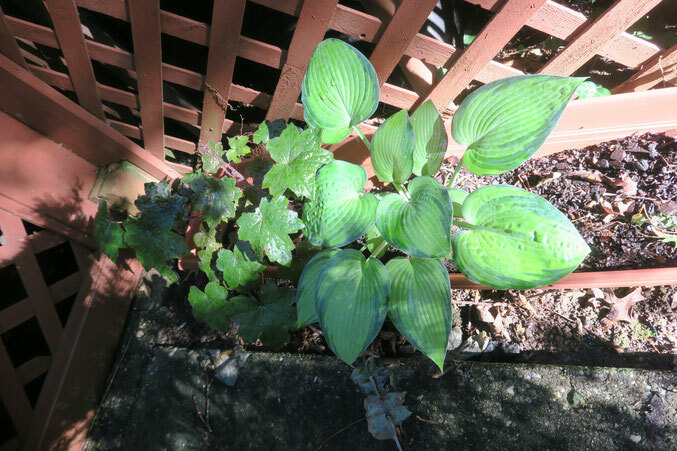 Having carefully walked down the steps from the deck, noticed the sun shining on this small planter at the base of the side of the stairs. 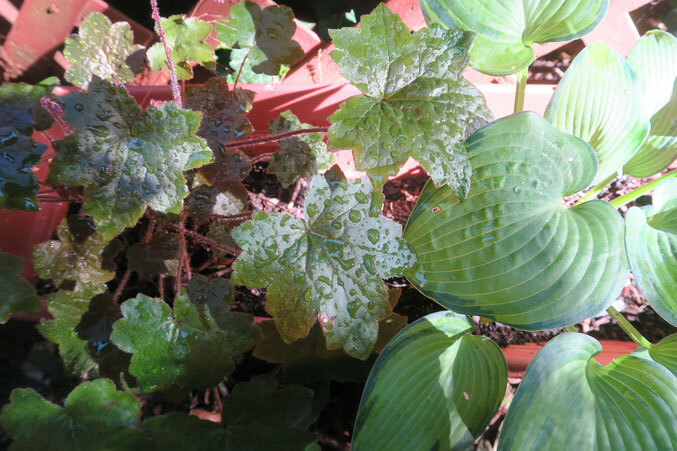 There were some rain drops still on the leaves of the plants that had that look of being on a waxed surface. It was so unexpected, that I quickly put down the bag of newspapers, and went inside for my camera. The resulting photos were a lucky catch. Even more lucky was my dropping my face down to focus in close, and putting it directly into a spider web - lol. The amazing part of this was, in realizing what was happening, I was able to immediately stop my forward motion and slowly back away with the hope of extracting myself from the web. To my great fortune - the back away - worked, and I was spared that awful and weird game of trying to wipe off a spider web from my face. 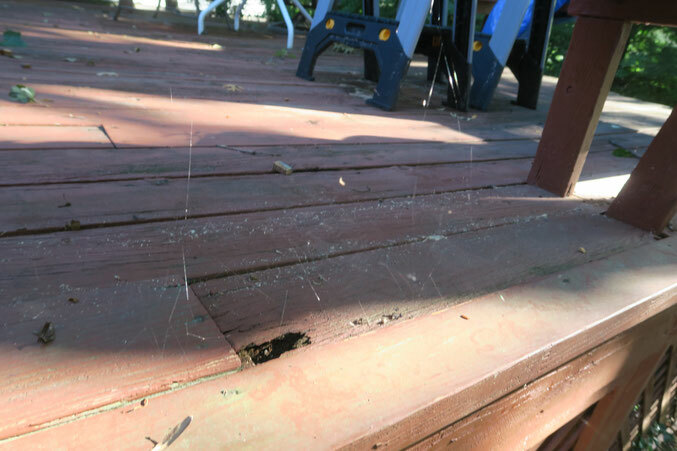 I included a photo of the spider web - and hope you can see it. PS: I took another look at the full planter overview and see there is one leaf that stands out, and almost says that it is the star! I agree. Oh man I know Taylor and I can imagine his reaction if he had walked into the spiderweb. He would have been waving his arms and screaming. Wow that picture with the rain drops on the leaves is truly beautiful. What kind of plants are those? Or are they just weeds? 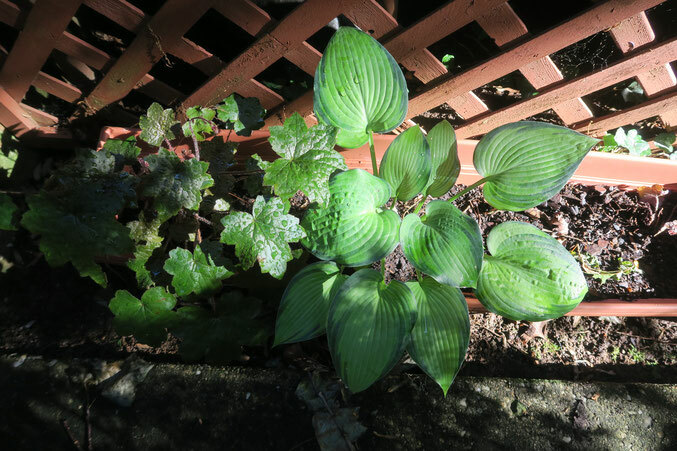 That plant on the right has gorgeous leaves! Oh I love walking through my garden after a good rain, it always smells so good. I wish it rained more often here. I can't stand spiders. Seems like you reacted a lot calmer than I would have. The colors on that one leaf are really incredible. The sky reflecting through the water droplets adds those little blue specks to the leaf, I think that is so cool! !